No matter how much you supplement, running will probably never be the "most anabolic" sport of all. On the other hand, it's certainly less catabolic than broscienctific horror stories of muscle loss and weakness would tell. 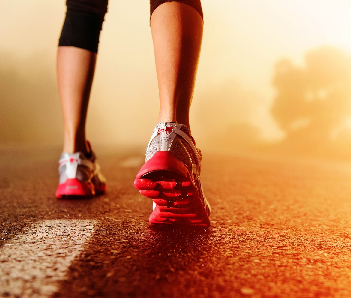 Researchers from the Massey University Wellington claim: "Ingesting 23 g of protein with 5 g added leucine achieved near-maximal FSR after endurance exercise." (Rowlands. 2014; my emphasis). If you think "near-maximal" fractional protein synthesis after endurance exercises sounds incredible, I would like to invite you to join me and take a look at the design and results of this recent study from the School of Sport and Exercise. In addition Rowlands and colleagues examined the phosphorylation (as a surrogate marker of activity)of signaling proteins within the mammalian target of rapamycin complex 1 (mTORC1) pathway to study the associations between plasma amino acids, translational signaling and myofibrillar FSR. The scientists' hypothesis was that the lower ingested quantity of protein (23 g) plus leucine (5g) would be sufficient to stimulate myofibrillar FSR to an equivalent magnitude to a 3-fold higher amount. If the latter was possible, Rowland et al. assumed that the mTORC1 pathway phosphorylation between the two protein-leucine would be identical, as well. The subjects were 12 endurance-trained male cyclists with mean age 30 y, stature 179 cm, and weight 78.1 kg (7.8) completed the study. Mean VO 2 max was 60.4 mL/kg /min with a corresponding Wmax of 323 W.
"The research design was a randomized single-blind triple crossover. Details of one of the three 7-d experimental blocks and the experimental testing protocol are provided in Figure 1. Two weeks prior to the first experimental block, participants completed a standard test on a Velotron ergometer (Racer Mate, Seattle, USA) to determine VO2 max and Wmax. The next day participants completed a familiarization of the testing procedure (100-min cycle, see below) (Figure 1A). Physical activity and diet were standardized for 4.5-d prior to a 2-d period of control prior toeach experimental testing day. Standardization was prescribed by way of verbal and writing instructions and record in training and dietary recall diaries; participants were asked to replicate on days -6 to -2 (outcomes not recorded). Control of exercise on protocol day -2 (Figure 1A) comprised a 90-min ride with a warm up of 10 min at 30% (Wmax), 8 min at 40%, 2 min at 50%, then intervals (4 x 5 min at 70%) interspersed with three blocks of 3 x 2-min intervals at 85%, 80%, and 75%, respectively, interspersed with 2-min periods at 50%, followed by 5 min at 40%." Following this ride and for the remainder of day and day following (Figure 1B), participants performed no training and were provided with a preweighed diet providing sufficient energy to balanceindividual caloric requirements based on the Harris-Benedict equation for activity factor of 1.6. The 100 min of cycling comprised a warm-up (as above), intervals (%Wmax) of 8 x 2-min (90%), 2 x 5 min (70%), 2 x 2 min (80%) and 3 x 1 min (100%), interspersed with recovery 2-min (50%); and 8 min cool-down (40%). During exercise, participants consumed 800 ml /h of artificially sweetened electrolyte solution to maintain hydration and were fan cooled. 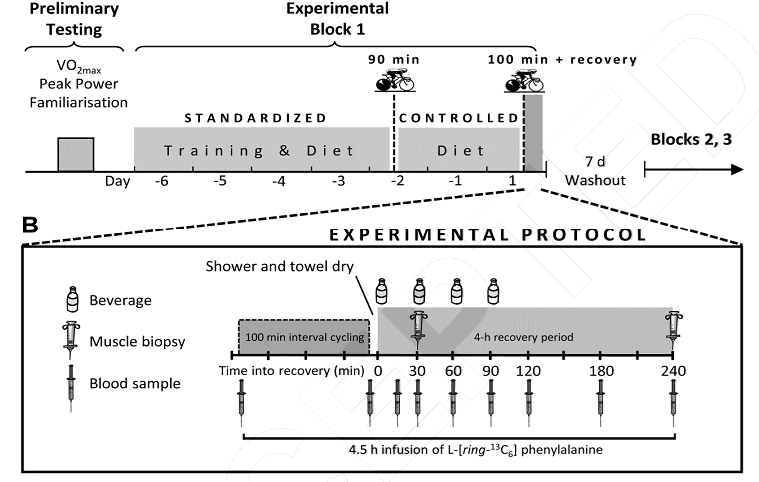 Following exercise, participants showered, and then ingested the first nutrition serving 10-min after cessation of exercise and subsequently every 30 min over the first 90 min of the 240-min assessed recovery (Figure 1B). 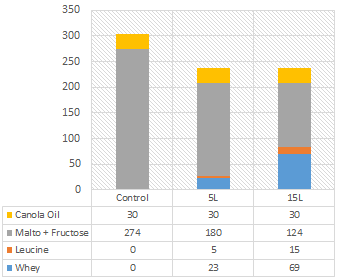 "The experimental beverages consisted of milk-based drinks containing milk protein concentrat and whey protein isolate (2:1 w/w), L-leucine, maltodextrin and fructose (1:1 w/w), and freeze dried canola oil. Four equal servings of 300 ml of the beverages were consumed during the recovery period for a total volume of 1200 ml.[...] The 15LEU supplement was compared to one-third of the protein-leucine quantity (23.3/5/180/30 g, 5LEU) - an intake hypothesised to yield a bioequivalent similar myofibrillar FSR, and to a nonnitrogenous, isocaloric control (0/0/274/30 g, CON). All beverages also contained 1.4 g NaCl, 14.4 g vanilla essence, and 3.6 g of emulsifier (Paalsgard 0096, Paalsgard A/S, Denmark) per 1200 mL." As the data in Figure 3 shows, even the "small" shake was potent enough to achieve (almost) maximal fractional 0.95%/h protein synthesis rates. With reference to previous research by Atherton et al., Rowlands et. al. speculate that they may have encountered a "muscle full" effect (Atherton. 2010) to explain the discordance between human muscle protein synthesis and mtorc1 signaling. Bottom line: Whether we are seeing a "muscle full" effect is something that's difficult to tell. What appears to be certain, though, is that resistance training allows for a greater uptake of protein synthesis (Tang. 2009; 0.15% /h in response to resistance training + whey protein). Although the supplements were somewhat different, I am thus inclined to believe that the absence of resistance training and the corresponding mTOR-C2 activation in response to aerobic ( (mTORC1 by supplementation, only) vs. resistance training (mTORC1 by supplementation, mTORC2 by contraction) is the limiting factor, here (Drummond. 2009). The latter would imply that the results are not applicable to resistance training directly. Even if corresponding studies clearly suggest that there is a limit to the benefits of "evermore" protein with resistance training, as well, the "limit" may be higher than "just" 23g of mixed dairy protein + 5g of leucine. Atherton, Philip J., et al. "Muscle full effect after oral protein: time-dependent concordance and discordance between human muscle protein synthesis and mTORC1 signaling." 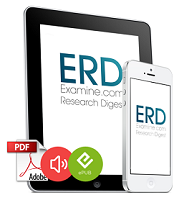 The American journal of clinical nutrition 92.5 (2010): 1080-1088. Drummond, Micah J., et al. "Rapamycin administration in humans blocks the contraction-induced increase in skeletal muscle protein synthesis." The Journal of physiology 587.7 (2009): 1535-1546. Rowlands, David S., et al. 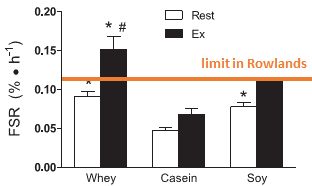 "Protein-Leucine Fed Dose Effects on Muscle Protein Synthesis After Endurance Exercise." Medicine & Science in Sports & Exercise (2014). Tang, Jason E., et al. "Ingestion of whey hydrolysate, casein, or soy protein isolate: effects on mixed muscle protein synthesis at rest and following resistance exercise in young men." Journal of Applied Physiology 107.3 (2009): 987-992.